BANGKOK, 21 NOVEMBER – A network of coordinators has been established to help manage the immense task of achieving Sustainable Development Goal 4’s transformative vision of inclusive and equitable quality education in Asia-Pacific. The regional network of national coordinators, comprising national representatives, members of the global steering committee on SDG 4 and a technical working group dedicated to the goal, was launched at the second Asia-Pacific Meeting on Education 2030 (APMED2030 II), which concluded in Bangkok a week ago. The launch of the network was one of the chief outcomes of APMED2030 II, which brought together more than 200 participants from more than 30 countries, including education ministry representatives, civil society organizations focused on education, development partners, UN agency representatives, donors and researchers. APMED2030 II gave participants a forum to discuss the immense challenges in achieving the seven targets of SDG 4 as well as to identify opportunities for collaboration. The distinctions between the current SDG4-Education 2030 agenda and the Millennium Development Goals (MDGs) and Education for All (EFA) era that preceded it were highlighted by UNESCO Assistant Director-General for Education Qian Tang in his closing remarks. Mr Tang said that two defining characteristics of the new agenda are its ambitious scope and where the onus for its achievement now lies. Opening the conference, Gwang-Jo Kim, Director of UNESCO Bangkok, the Asia-Pacific Regional Bureau for Education, spoke of the vast diversity of the region, including the differing priorities and challenges among countries. “We also, of course, have much in common,” Mr Kim said, “and most importantly, we share the same vision for education and are committed to achieving the same goal – SDG4. The importance of collaboration was also stressed by Karin Hulshof, Regional Director, UNICEF East Asia and Pacific Regional Office, who said APMED2030 II provided opportunities to build and expand partnerships among countries and also with intergovernmental organizations, new donors and private partners. Ms Hulshof added that among the key areas to be addressed is the “unfinished business of the EFA era” – in particular the 17.3 million children who are out of school in the region. Chaiyosh Imsuwan, Deputy Permanent Secretary of Thailand’s Ministry of Education and Secretary-General of the Thai National Commission for UNESCO, reaffirmed Thailand’s commitment to educational development both within its own borders and beyond. Education specialist and consultant Simon Ellis outlined a tentative framework for Education 2030 in Asia-Pacific, which included regular reviews every five years and corresponding adjustments. He also outlined some of the key challenges for SDG 4 in the region, which included the need for a coherent plan for addressing all of the facets of SDG 4, requiring “seamless coverage” of early childhood care and education (ECCE), formal education, non-formal education, technical and vocational education and training (TVET) and higher education. Given the boundary-spanning nature of some of the targets – the role health plays in ECCE, for example – he said buy-in outside the education sector was also crucial to the agenda’s success. 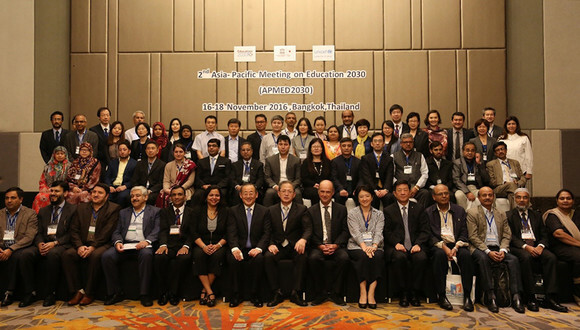 In addition to government and intergovernmental representatives, APMED2030 II also brought together representatives from major sub-regional bodies: the Association of Southeast Asian Nations (ASEAN); the Southeast Asian Ministers of Education Organization (SEAMEO); the South Asian Association for Regional Cooperation (SAARC); as well as the Pacific Islands Forum Secretariat (PIFS). As Jordan Naidoo, Director of the UNESCO Division for Education 2030 Support and Coordination, said, inputs from these groups are important to achieving SDG 4 as they help identify common areas of concern. “While we work together globally, there is also a need to work more locally in the field of education. Certain small groups of countries have common issues that they need to work on together,” he said. Albert Motivans, Chief of Education Indicators and Data Analysis at the UNESCO Institute for Statistics, pointed out areas of alignment between what sub-regional groupings identified as priorities and some of the key targets in SDG 4. These common areas of commitment included ECCE, TVET, equity, and teacher development. An announcement was made at the close of APMED2030 II that a third APMED2030 meeting would be held in Bangkok next year.